Character Creator 2.0 has corrected several issues with geometry morphing, allowing more flexible and better character creation process both in quantity and quality. Enable / Disable Conforming Cloth: Geometry conformation is now optional, this is useful for items that should not fit to the shape of the body such as armor, hair, etc. Mesh Editor for Accessories: Greatly enhances the flexibility of accessory creation. One advantage of using Character Creator is that apparels and accessories can be made to fit around the shape of the character. For Character Creator 2.0 , we have improved the said design by adding the Enable Conforming option. This allows one to decide whether or not an article on the character should shape according to the underlying body shape. Click on a target apparel, hair, or shoes and open the Conform Clothing window. Checked (default setting): The asset will conform to the underlying body shape. Unchecked: The asset will maintain its original shape ignoring the underlying body shape. If conform is disabled and body shaping is complete, then one can rely on Edit Mesh Mode to adjust the details of the geometry. Character Creator 1.5 supported the creation of outfits, shoes, hair, and skin based mesh editor. 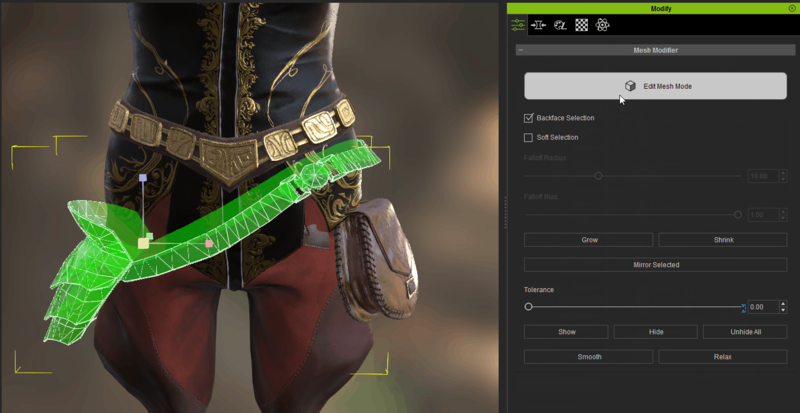 This time around for Character Creator 2.0 , we have added support for unrestrained editing of mesh on accessories. Select on a target object and enable Modify. 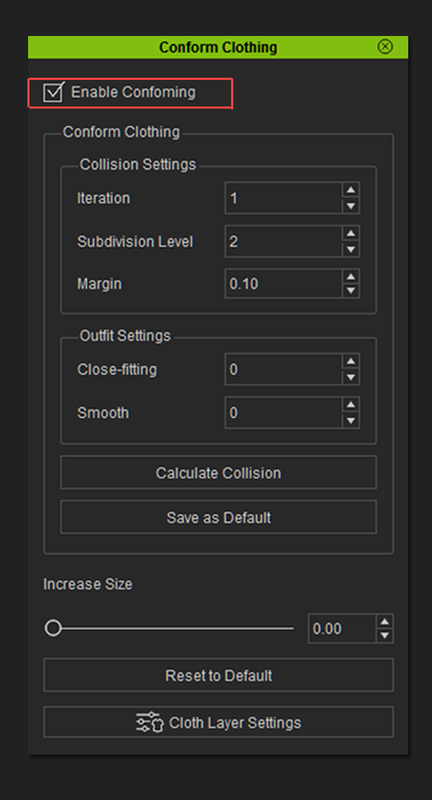 Under the Edit Mesh Mode, use the left, right translation, scale, etc to adjust the mesh. Once the editing is complete, disable Edit Mesh Mode to finish. 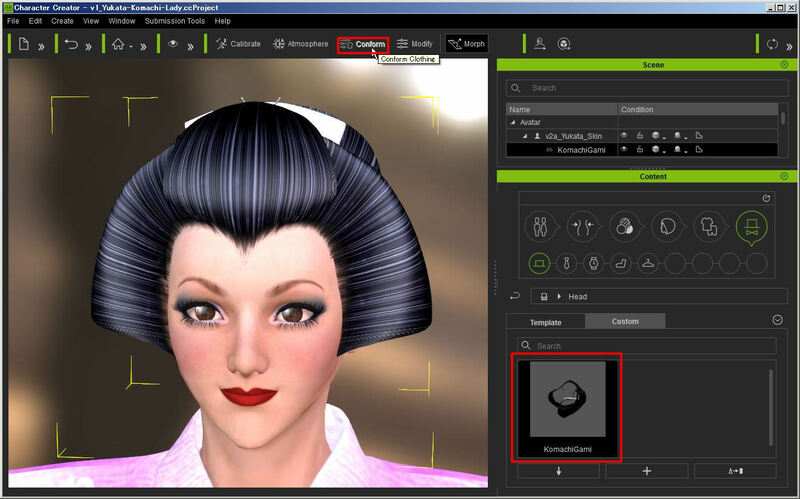 Hi, I attached the traditional Japanese hair (Poser Prop) to the CC Base Head in the iClone 6.5 and imported into CC2.0Beta through 3DXchange. 1. After clicking the hair, [Conform] button does not become active and the window does not open. 2. Icon image is not shown properly. I wonder there are any solutions for these. Not shure but I think you're hair is saved as an accessory and not as a hair Item. So you can only scale it, not use with the conform feature. As you indicated, the hair is saved in Content/Accessory/Head as KomachiGami.ccACC, and scaled at Modify/Edit/Transform. [Confirm] is not applied to Accessory. So, I wonder why Conform feature is not expanded to Accessory. I believe Conform is based on Cloth layers, which are more or less pre-shaped to conform. An Accessory is an attached prop, which can be of any shape and is therefore not necessarily conformable. Icon image became proper, too. Following format are Conformable on the CC now: .ccHair, .ccShoes, .ccCloth and .ccGloves. These various formats seem to be determined automatically in the skinning process of how related to CC Base body part. The Blazer was exported from CC2.0 and skinned to the AYAKA body in the 3ds Max. I think it is desirable to be able to use the [Edit Mesh Mode] on any Caliibration poses in the CC2.0 without changing the Pose to T-Pose.